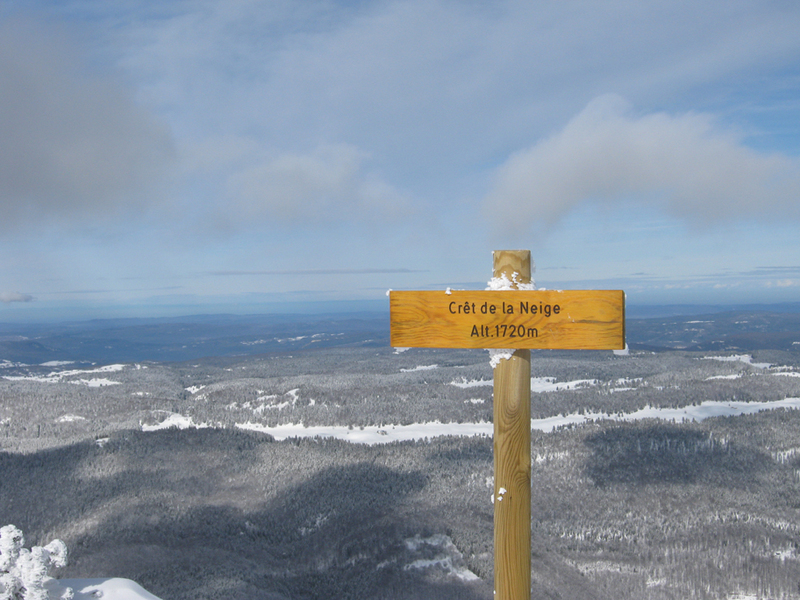 The Crêt de la Neige is at 1720m the highest summit in the Jura mountain range. As soon as I arrived in the parking lot of hotel in Geneva the Jura mountains caught my eye. Beautifully located to the west of Geneva, the early morning sun illuminated the snow-covered peaks and flanks. I also thought that I could clearly make out the high point, as I was able to see the summit marker (later I found out that it was the huge summit cross of Le Reculet, a peak located 1km to the south of the true highpoint and at 1719 also 1 meter shorter). As I still had to cross the range to get to the town of Lelex on the western side, I quickly left Geneva and spent the next 45 minutes navigating first the mostly snow-free switchbacks leading up to the pass, and then the mostly snowed-in switchbacks leading down to Lelex. As on so many occasions this winter, I again scolded myself for not having bought decent tires (to my credit, I must say that I tried to get some winter tires, but they were completely sold out). I promised to myself that if I would ever get to Lelex in one piece, I would buy chains. It was still somewhat overcast, and more snow would make my departure later that day impossible. But no worries, I arrived in Lelex safe and sound and soon was ready to deploy for the mountain. Considering the wintery conditions and my lack of experience (what an excuse) I had decided to take the gondola up to the skiresort and start my hike from there. Not knowing when I would go on another mountain trip, I also did not want to ruin my chances of not having a shot at the Cret Pela and the Mont d’Or, my other two objectives of the day. I therefore paid 6 Euros and was quickly transported to the top of the lift to La Catheline at 1000 meters. I quickly found signs pointing out the snowshoe trail to the summit and after having walked for just a few yards also put on the snowshoes. The trail had not been used yet that day and the snow was just too deep for simple shoes. All the trees were covered by at least 10cms of snow and the whole landscape was beautiful. After 15 minutes of hiking my trail joined another one (presumably the one leading up from the valley) and I could see that there were already some people ahead of me. For that reason the fresh snow was already nicely compacte and I continued for a while without the snowshoes. The trail continued through a beautiful snowed in landscape and I stopped numerous times to take pictures. Soon I caught up with some other hikers, first a French couple and then some other hikers, but all part of the same group as they were waiting for each other. I passed them, but then of course was not able to benefit from them stomping down the snow for me anymore. Sure enough, I soon had to put the snowshoes back on and while doing so, the group was passing me again. But I caught up with them again shortly after (not that this is a race or anything like it) and then arrived at the Jura Crest (1680m). A nice view point, because I could now look down to Geneva and the lake again and even more importantly, I could see the Alpes in the distance with Mount Blanc dominating the landscape. That is one of the advantages of hiking in the winter. The air is often much clearer and one can therefore look further. The crest is also a nice location, because the Jura mountain range is basically a very long rib without too many changes in elevation. The high points are just minor bumps that make them stand out from the long and flat crest. Anyway, I got to the summit after following the crest for another 500 meters or so. It was a very sunny day, but here the wind was blowing ferociously hard. Gusts of snow were constantly blowing me in the face and even though I was sweating up to that point, I know regretted not having brought an extra layer. Therefore, I did not stay long at the summit, except to take some pictures and to admire the amazing scenery. I thought I would be the first one on the summit, but I was able to make out some faint traces of skis in the snow which continued of to the south. Apparently, somebody was traversing the crest on skis. That would be a nice thing to do, but maybe I postpone that until the summer. Nevertheless, I tried to follow that idea a bit by hiking the crest back to the ski resort. Walking with the wind I was able to enjoy the scenery a bit longer and to tag one more summit (well a bump really, but it has a name, Montoiseau, so that counts). From there I heeled down to the station and took the gondola down. It was 12:15 when I arrived at the bottom. The whole outing had taken barely three hours, even though it felt much longer. I am just not in shape anymore. I bought my snow chains, but realized then, that in order to get to my next destination, Cret Pela, I did not even have to go back the way I came. No worries, I thought, I will need them some day. Great, the day was only half over, which gave me time for another departmental high point (Jura) and also located in the mountain range of the same name. At about 13:30 I pulled into the parking lot of the Serra ski resort. I was a bit confused because my IGN print out showed a ski lift by the name of Teleskis des Auvernes, but I was not able to locate it. Upon asking if I was a the right place, I was told that the missing ski lift had actually been taken down the previous summer. I set out and followed the ski slopes for a while. I did not put on snowshoes yet, because the incline was manageable without them. I only had about 300 meters to climb and I though that I could just take my time in getting to the top of the former lift, but I was soon running out of patience and instead of following the switchbacks of the ski slopes, I put on crampons I hike straight up the mountain. I soon arrived at the top of ski resort (a second newer lift had replaced the older one) and found that I had covered about all of the elevation but only half of the distance to the actual high point. Now I had to put on snow shoes, because I entered complete virgin territory and I am a certain that noone had been there in days. The map was showing a forest road that led to near the summit, but I could see no such thing. I therefore just wandered of into the general direction of where I thought the summit would be. The snow was just the finest poweder and with every step I sank into it knee-deep. It was getting to be very strenuous. After 20 or so minutes of this fun, I found the forest road and followed it for another 20 minutes until I crossed the a GR (signs pointed this out). Another sign said that the Cret Pela was only another 5 minutes from that point. I rejoiced and almost sprinted up to the high point. A short sign (maybe short because of all the snow) marked the summit, and I quickly took some summit pictures. Again I had magnificent views of Mont Blanc in the distance. Beautiful. I then decided to return a different route. I found the GR markers (white-yellow instead of white-red) on a nearby tree and followed it down through the forest. I have never experience such beautiful wintery conditions. Did I mention that before? The sun was illuminating everything, snow everywhere, hardly any trees or bushes visible anymore, because of all the snow. Unbelievable. However, much too soon I arrived back on the ski slopes with all its load and obnoxious users (as if I had never done that) and from there it was only a short stroll back to the parking area. This hike had taken me longer that I had thought, and once I arrived at my next possible destination of the day, it was already after 5pm and therefore too late for me to get up and down before nigthfall. I did have a head lamp, but honestly I was too tired for another hike. And thus Mont d’Or would have to wait for another day. That way I would also have another opportunity to hike in this beautiful part of France. Maybe in the summer next time.